What do you do when you're in the middle of baking and suddenly realize there are no eggs in the house? Substitute something else you do have, of course! 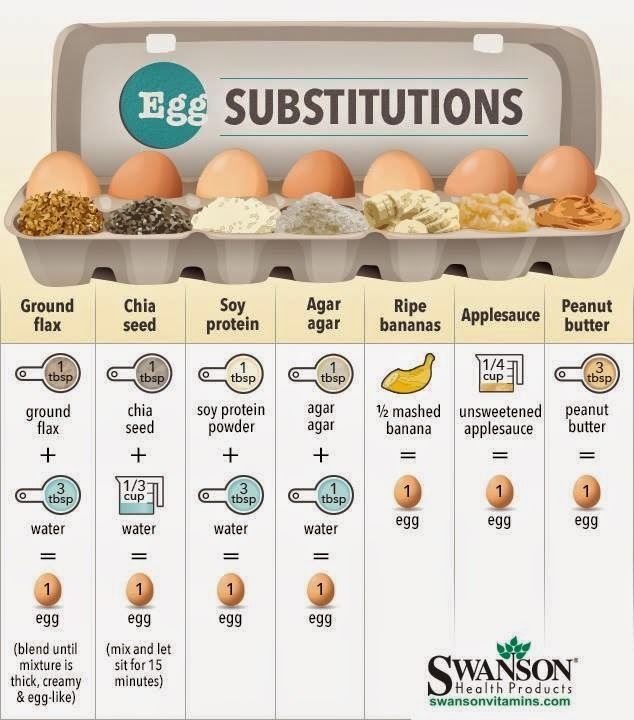 I saw these Egg Substitutions on Facebook and thought this list might come in handy someday. So I'm sharing. I'm going to have to try some of these even if I'm not out of eggs. Just because. I'll save the eggs for omelets! 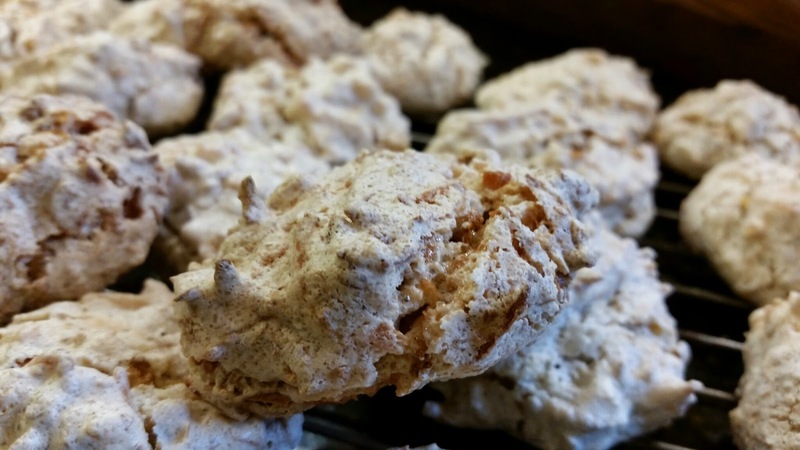 I had some egg whites in the fridge - leftover from my Secret Recipe Club recipe, which you will get to see on July 7, so be sure to come back for that - so I went looking for a recipe to use the egg whites. I had a recipe saved from a while back, but I decided to try something else, even though I haven't tried that one yet. It looks really good, so I am going to have to try it next time. These just sounded interesting. Once again, I am making cookies with cereal. 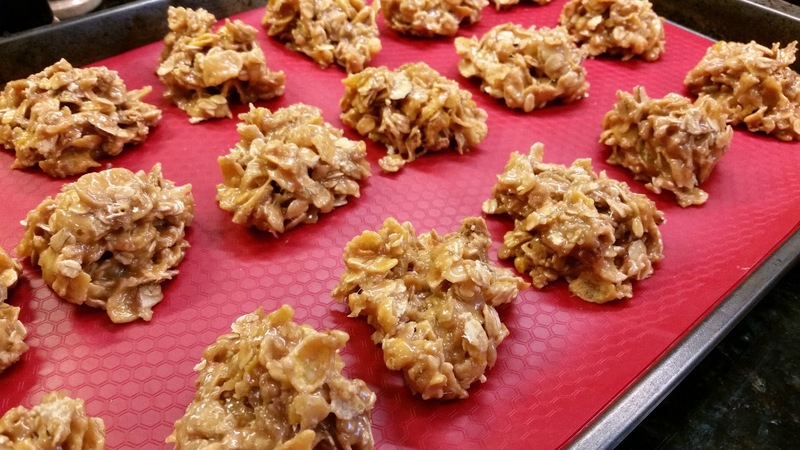 These also called for cornflakes, and I still don't have any, so I used a combination of Wheaties and Honey Bunches of Oats. In a large glass or metal bowl, whip egg whites until stiff peaks form. Stir in sugar. Fold in coconut and crushed cereal. Drop by teaspoonfuls onto prepared cookie sheets. Bake for 18-20 minutes in preheated oven, or until golden. Remove from oven and let sit for a few minutes before moving from cookie sheets to cooling racks. These turned out really good. They're kind of gooey in the middle with a nice crunch from the cereal. The only thing I want to change next time is to cut down the sugar. I should have read the reviews before making these, instead of after, because several people mentioned cutting the sugar down. 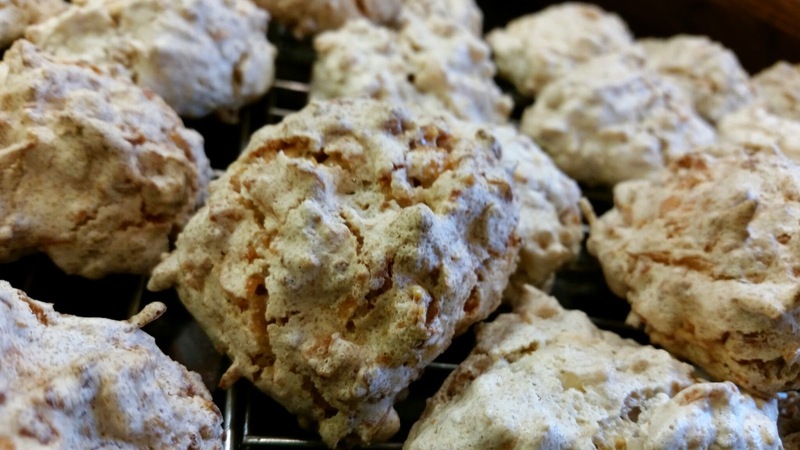 A couple of the reviewers also mentioned that these weren't really like macaroons, which I don't really know because I've never made them before, or even had any as far as I can remember. All I know is that these are really yummy, and it's hard to stop eating them! Tip: Measure cereal into mixing bowl and use a plastic cup to crush it. 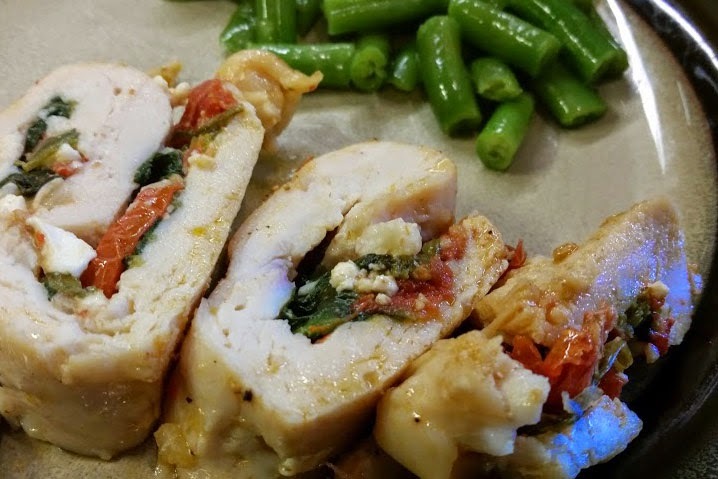 I know I've seen some recipes for spinach stuffed chicken breasts, probably on Pinterest, but when I started looking, I didn't find any that were exactly what I was looking for. So I just put some stuff together, and it really turned out good. The flavors were amazing. Heat tomatoes and oil in a skillet over medium high heat; add onions and garlic, and cook until onions become translucent. Add spinach and continue cooking until spinach is wilted. Add a pinch of sea salt, and set aside. 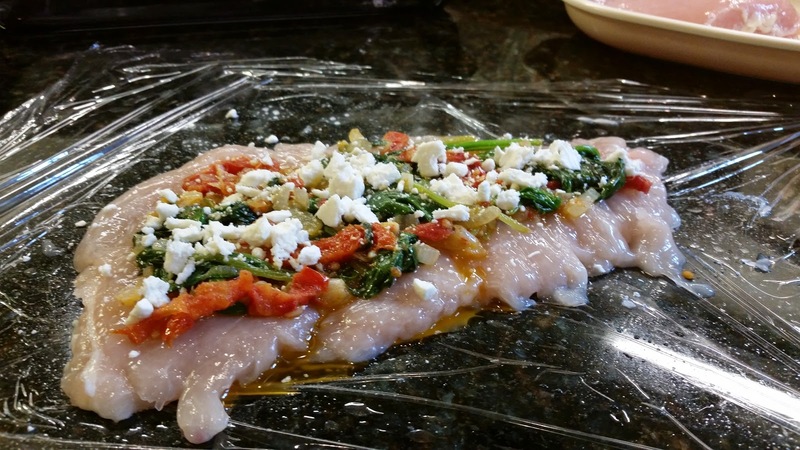 Spread half of tomato/spinach mixture on chicken breast. Crumble 1 to 2 T. feta on top and roll chicken breast up, starting with the narrowest end. Secure with toothpicks and transfer to a baking dish. Repeat process with second breast. 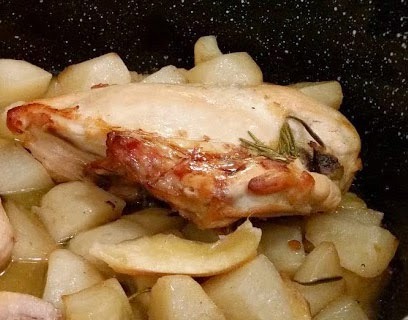 Drizzle the breasts with any oil remaining in the skillet, season with salt and pepper, and bake at 350° F for 30 minutes. Let sit for 5 minutes; Remove toothpicks, slice and serve. And that's it. It's really simple, and has me wondering why I haven't tried this before. 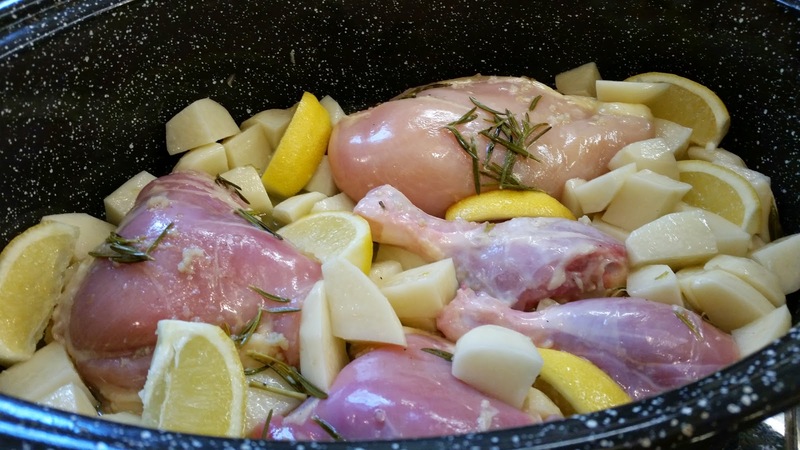 There is a lot of going back and forth between handling raw chicken and spreading other ingredients or whatever, so it's really handy to have a sink full of soapy water while you do this. Or just keep using more soap and washing your hands like I did. I didn't really measure any of my ingredients, but these amounts are close, and this is one of those things where it doesn't really matter. Throw in what you have or what looks good to you. I think this is going to become a regular recipe around here. 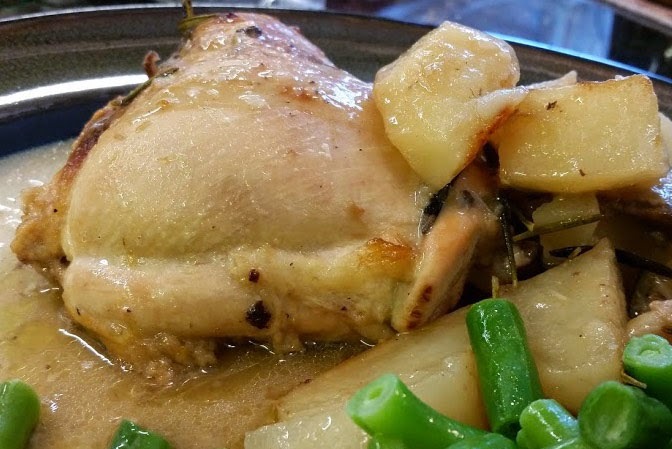 The flavors go together so well, and the chicken is really moist and flavorful. 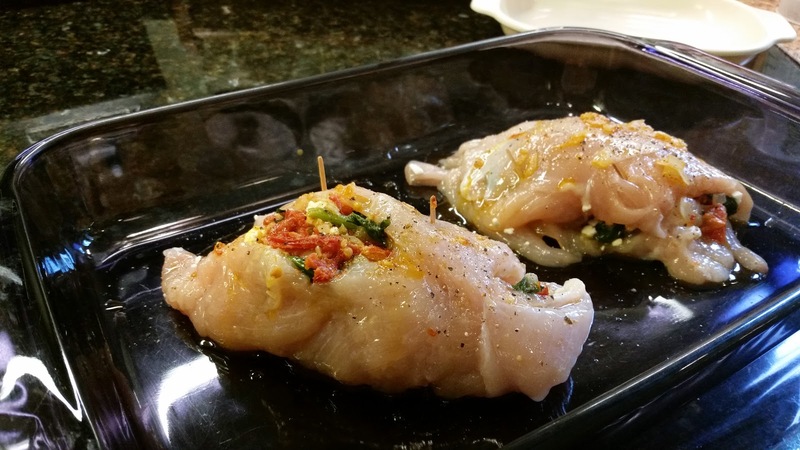 Of course, now that I've discovered how easy it is to make stuffed chicken breasts, I may have to find some other things to stuff them with too. What do you think? 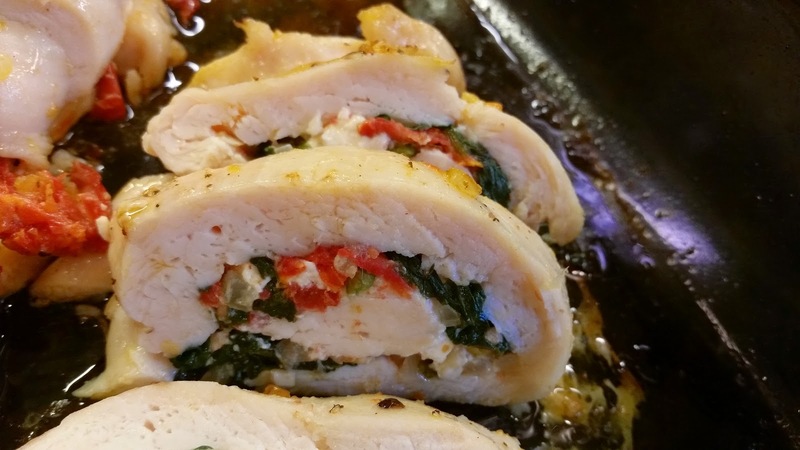 What would be good stuffed into a chicken breast?